Congratulations are in order for Brooks Ayers! 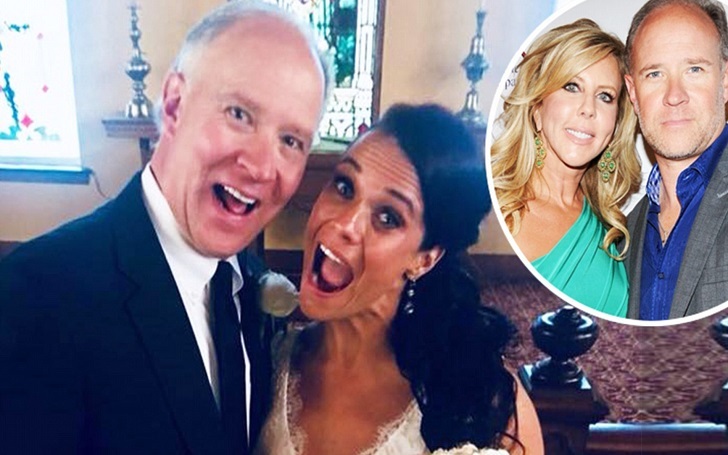 The former boyfriend of Real Housewives of Orange County star Vicki Gunvalson is now a married man; tied the knot to girlfriend Christy Linderman, who he was dating for more than a year, multiple sources have confirmed. Brooks took to his official Facebook account on Sunday, March 25, to announced his big day, by changing the relationship status as married and sharing a picture of his wife. Check out the couple's beautiful wedding photo. As per the report, Brooks' wife is from Ohio and she has a 23-year-old son from her previous relationship. The couple walked down the aisle in a "small white chapel" in French Lick, Indianan in front of friends and family members including Christy's son on Saturday, March 24. Brook has not been shy to share her romantic relationship with Christy as he shares photos of the two via social media sites. Check out one of them. Brooks and Vicki split up in August 2015 after staying in an on-off relationship since 2011 while the 10th season of RHOC was airing. Vicki was previously married to Donn Gunvalson from 1994 to 2014.